Manga Studio 5 keeps surprising me with its wealth of useful features. I've spent the last couple of days enjoying its ability to integrate 3d objects into frames. These can be output as is or merely serve as mannequins to help guide your hand drawings. See the image at left for an example of the drawing guide. 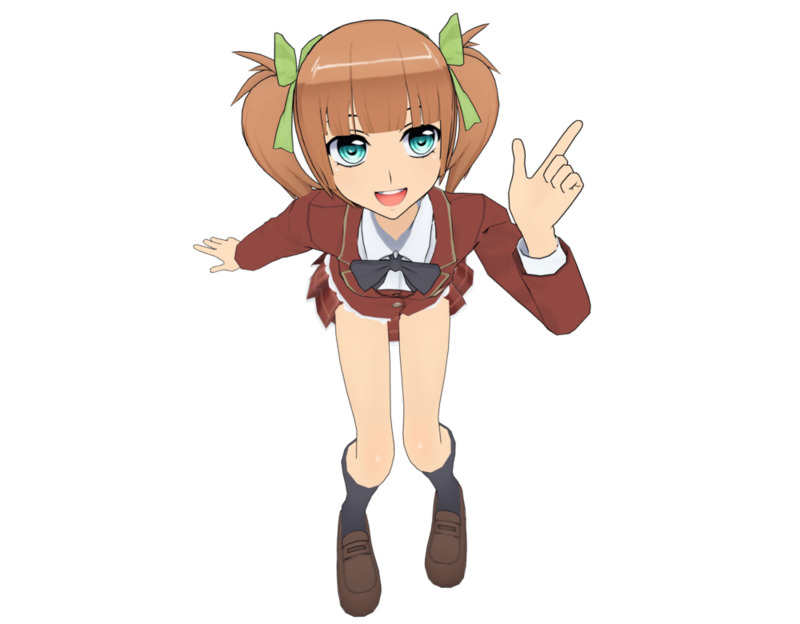 The software ships with four manga style textured schoolboy and girl characters and a male and female mannequin. The latter two can be morphed to approximate different body types. 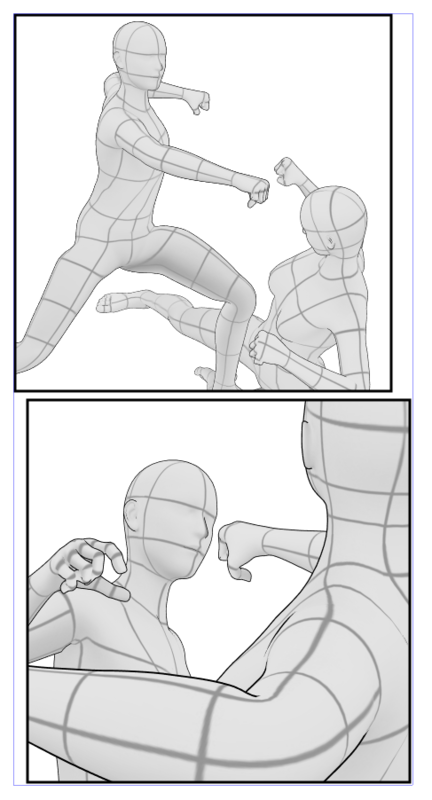 The figures can be dropped into any scene and posed manually or with one of the 100 pre-made full body poses and 50 hand poses. All the essential camera presets are available with the click of a button, or you can move, rotate or scale your camera to your heart's content. 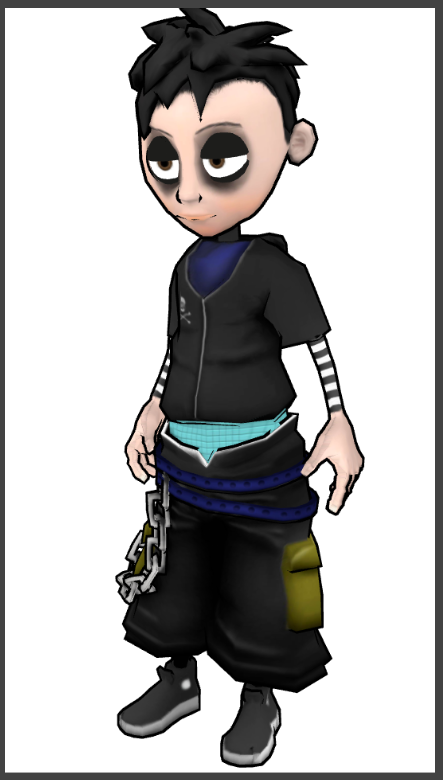 Character models come with a wide assortment of faces, hairstyles, clothing and accessories. There are also 3d props and sets (in addition to 2d color and monochrome patterns and clip art). It's really an amazing assortment given the price of the software. The program also imports a variety of 3d formats. I had no problem loading up some FBX files created in Maya, although the textures on these objects didn't display as nicely as the native character files. You can drag and drop FBX files directly onto your current frame, but embedded textures do not render. Here the line width is set to 12 pts. It's a little tricky to get your 3d content positioned just right. Camera and object controls are pretty finicky, especially when you've got multiple characters sitting on the same layer. But all in all, this is a great feature for the artistically challenged that can also benefit professionals who want to quickly layout a new composition. I hope Smith Micro publishes information for Western third parties who might create more addon products. 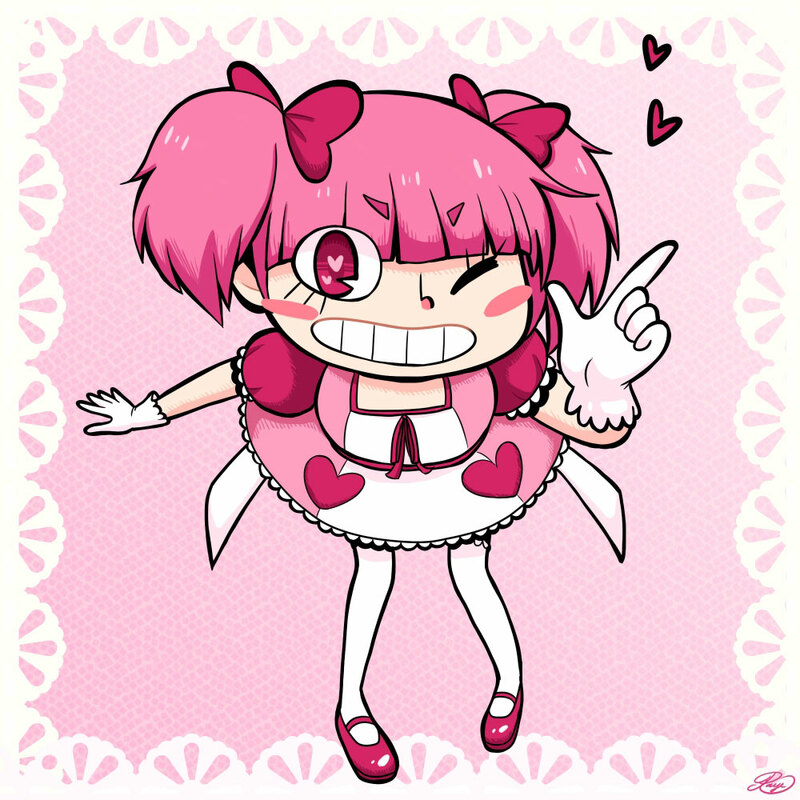 Manga Studio is developed by Japanese company Celsys and is known as Clip-Studio there. My Japanese is non-existent, but visiting their site, it appears that there are a lot of third party props and poses available. I came across one set of third party poses from Michael Hartlef. His $4.99 set of Super Hero Poses Vol #1 includes 20 comic-inspired settings that I highly recommend. Installation is a bit tedious, but that's a limitation of the software, not of Michael's work. I promise not to turn this blog into a Manga Studio 5 love fest, but do yourself a favor and check it out. Whether you run it on the Surface Pro, a traditional desktop or a Mac, you're bound to enjoy it. UPDATE: Turns out you can import textured objects. At this point I've tested with OBJ format. Create a .zip file with the object, the material (MTL) and the texture in PNG format. Drag and drop the archive into your panel and voila! Unfortunately, I still haven't found a way to register the 3d material, adding it to the library permanently. 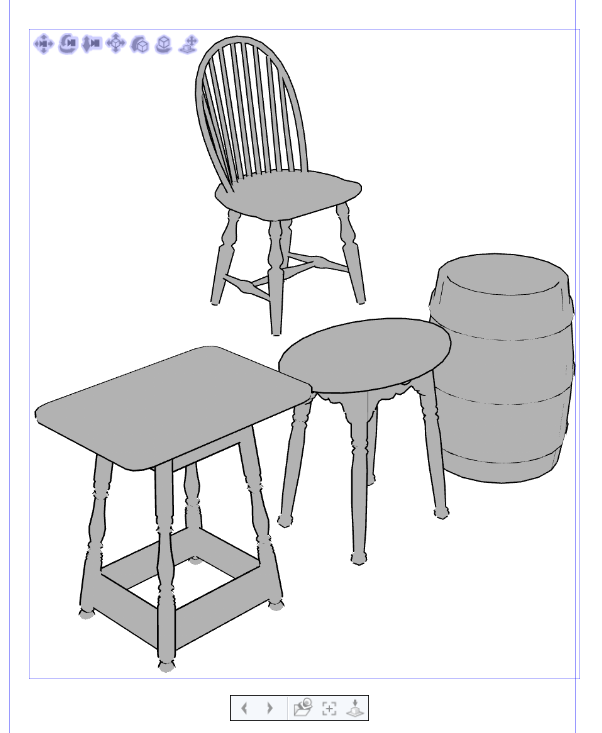 Imported OBJ file and PNG texture as displayed in Manga Studio frame. Sweet. UPDATE 2: Turns out you can register an imported object to the 3d material library. You just have to know where to look (one of Manga Studio's more annoying tendencies). There's a sub-menu in the 3d palette (see image below). Click it and select "Register image as material." Select the folder where you want your object located, add a few meaningful tags and save. Thanks to RuntimeDNA forum member garlam for pointing me to the illusive sub-menu. Garlam also has a thread explaining custom brush creation that is definitely worth a read. The 3d material palette's sub-menu button: It's easy to miss (and difficult to target on the Surface Pro's screen). UPDATE 3: Thanks to the help of RuntimeDNA Manga Studio forum user senyac, I was finally able to get textures to appear with imported FBX files. The key is to zip up the fbx file and texture in the same directory. Usually when FBX files are exported with embedded textures, a separate texture folder is created. I was only able to get one texture to appear when I tried this with DAZ Studio and Victoria 6. But this may be all you need if an object is mapped for a real-time application. 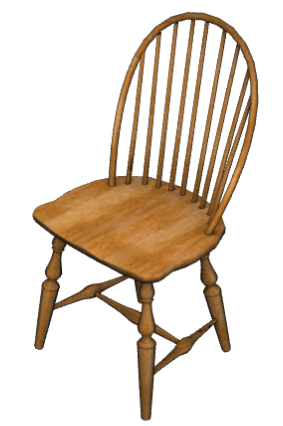 The character below was modeled in Maya and has only one texture map. Hi Surface Pro Artist readers! I'm Raye Rodriguez, an animation student at NYU currently interning at Frederator Studios in Burbank. The first time I attempted to use Manga Studio was several years ago when I was just beginning high school. I was looking for a program that would give me better line quality than what I was getting in Photoshop. The interface confused me and I could never get my lines to look clean (I was having a weird anti-aliasing problem that I never fully understood). After several unsuccessful attempts at using the program, I eventually gave up on it. I probably would have never gone back to the program if it wasn't for my dad (creator of this blog!) constantly raving about how great Manga Studio 5 had become. The picture I'm going to walk you through today is the first complete image I've ever drawn and colored solely in Manga Studio. I started with a messy sketch of my character Rosemary that I unfortunately did not save. From this first attempt I realized that I had no idea how to draw Rosemary's arms and legs in extreme perspective. I used what I think is the coolest tool in Manga Studio to help myself get Rosemary's anatomy down. I took one of the program's premade 3D characters, put her in the pose I was trying to draw and adjusted the camera's focal length so she was in perspective. From there I was able to look at the 3D model as a reference for my sketch. I had to fudge it a little since the premade doll and Rosemary are so anatomically different (Rosemary's head is huuuuuge), but the model still helped a lot. I used the Pen Tool's G-Pen with stabilization at around 9. 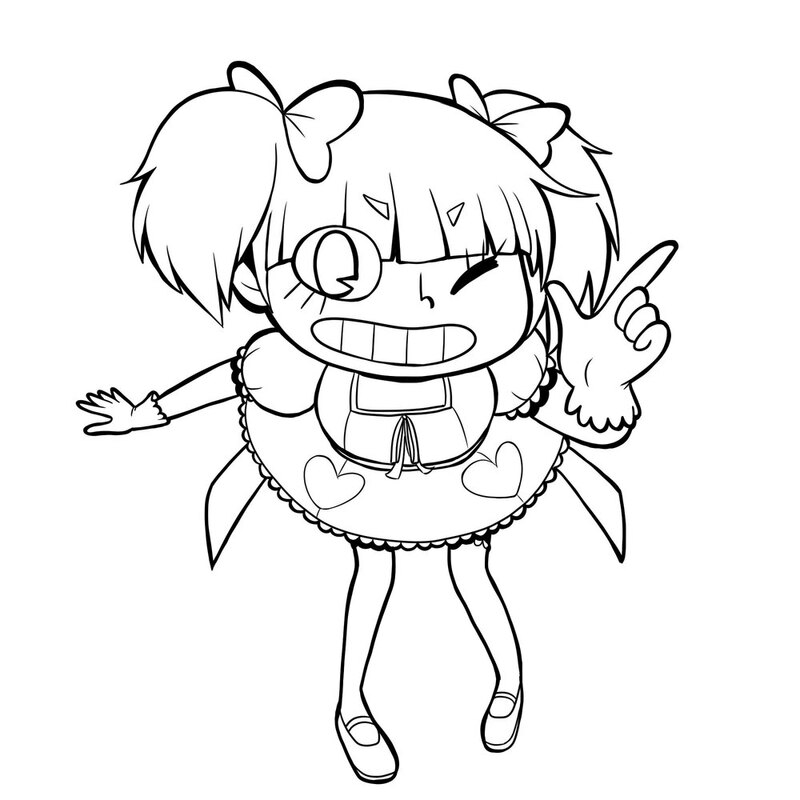 Next I made my first pass at inking. I used the Turnip pen with stabilization somewhere between 25-40….Big difference I know, but I don't actually remember. It was… more than before. I didn't focus too much on line weight yet, I was just trying to get it all down. Here's where I really started to get into detail with the lines. I made areas closer to the camera and areas where lines overlapped darker, and added a border around the entire figure. I started by using the Auto select tool to select areas of the same color. I used the Brush Tool's "Bit Husky" brush in the India Ink section to fill in the selections. I made different layers for each color in order to make shading easier later on. Once the flat colors were down, I locked each layer one by one and added the shading and highlights. The last stage of this picture was adding the background. I made a pink gradient using the Gradation Tool. I used one of the premade Color Patterns on overlay to add a bit of texture. Then I pasted a lacey Monochromatic Pattern into image. I had to rasterize it before I was able to edit it at all. I moved the bits of lace so they frame the picture. I had to duplicate the border layer a bunch of times to increase the opacity and use Layer Properties to adjust the colors… There's probably an easier way to do all of this, but I couldn't figure it out. And that's about it! 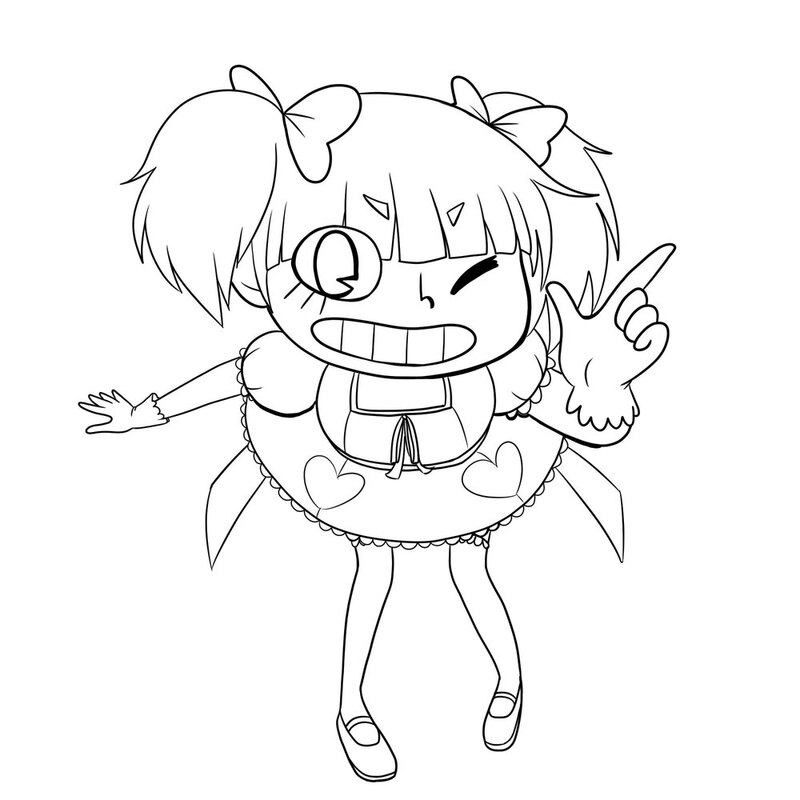 I have to say, Manga Studio really has come a long way since I tried to use it all those years ago. 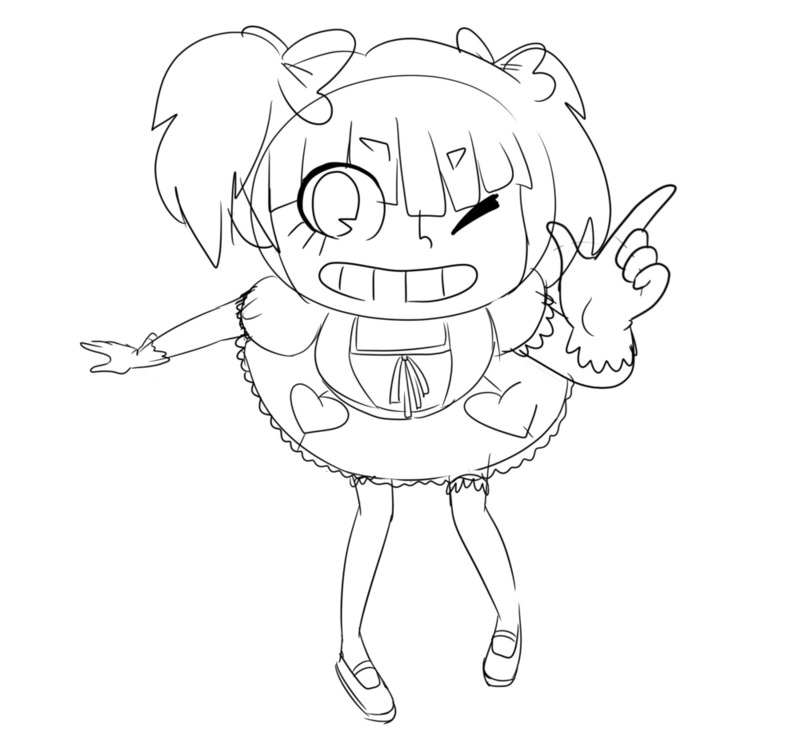 I wish I'd had it back when I was really struggling to understand how to create good digital line art. I'll definitely continue experimenting in this program and using the 3D models as references when I get stuck.